Why is Microblading Eyebrows So Popular? It does not really matter whether you like them full and bold or arched and feathered, eyebrows are without a doubt, the most important facial feature. If you are not satisfied with how your eyebrows look, there are many ways to update them like using brow gels and pencils. However, there is a new option that offers semi-permanent results – microblading. Microblading eyebrows is a new trend that is seeing more women spending hundreds of dollars to perfect, what most of them call, the most important part of their face. Social media, mostly Instagram, has contributed to the popularity of this trend. Celebrities like Lucy Hale, Cara Delevingne, and Lily Collins have had their eyebrows microbladed, creating a lot of buzz. This buzz is seeing more women purchasing pencils, brow gels, powders, and tattooing their brows to create that incredible look. How Does Microblading Eyebrows Work? Microblading entails creating a semi-permanent tattoo using tiny needles to assist deposit pigment under your skin. This process is done by hand and takes about two to three hours to complete. Surprisingly, a lot of time is spent on shaping the brows, assessing asymmetry, perfecting the outline, measuring bone structure, and doing before and after care. The actual process only takes about 30 to 60 minutes. How microblading is done depends on where you go. However, most beauticians see their clients twice – once for the initial appointment and then after the eyebrows have healed for a touchup. Before going under the needle, you need to prepare your body to ensure everything goes smoothly. You should avoid NSAIDs like ibuprofen, acetaminophen, and any supplements with niacin and Vitamin D for 48 hours prior to the procedure. Moreover, you should not use caffeine and alcohol for at least 24 hours as these substances can cause excess bleeding. If this happens, the pigment will not fully retain into your skin. The great thing about microblading eyebrows is that you can have little eyebrows, have lost your eyebrows due to alopecia, or have ultra-faint brows, but be able to create a similar appearance to naturally full brows. You can even have custom colors that match your natural eyebrows to achieve a multidimensional and natural look. Apart from not having to retouch your brows, another great thing about microblading is that it can help you achieve your eyebrow goals. This is regardless of whether you have little or a lot of hair to work with. Another great thing about microblading eyebrows is that there is no downtime. You can immediately floss your new brows on Instagram immediately after the process. However, you should consider going for a follow-up check a month after your first appointment. People heal differently but it usually takes about 30 days to recover. Unlike natural eyebrows or eyebrow extensions, eyebrows that have undergone microblading are usually low maintenance. After healing, you can enjoy swimming or even rub them without the fear that they will fall off. They do not need any special care apart from a touchup once a year. Since microblading costs anywhere from $500-1600 depending on where it is done, it can be a bit expensive for some women. However, getting up in the morning with perfect eyebrows may be worth it. Before your beautician performs microblading on your brows, he/she applies a numbing cream and a liquid anesthetic to reduce discomfort. If you are worried that the procedure is painful, some clients do feel a slight discomfort, but the whole process is relatively painless. Is Microblading Similar to Tattooing? 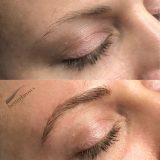 Microblading is a form of cosmetic tattooing. In fact, microblading is a manual process done by hand. With this, your beautician is able to control the depth and width of every hair stroke to create real-looking eyebrows. Before microblading, you need to do a lot of research on the person that is going to do the procedure. You need to ensure that he/she has extensive knowledge and experience in microblading. For the best possible experience, they should be a cosmetologist or esthetician with a background in skincare and certified by the health department in their state. If you, like many other women, have never had properly grown eyebrows, have over plucked them, have suffered from hair loss due to illness, or just want thicker eyebrows, microblading is an option you should look into. Good eyebrows are a status symbol, and the moment you have them, your life will be on point. How Much Is Microblading In New York City?